Buckhead’s old Roxy Theater is no more. It has been reborn as the Buckhead Theatre, Buckhead’s answer to Midtown’s Fox Theater—well-appointed after $6 million-plus in renovations and possibly poised to put Buckhead on the map as a stop for top national entertainers. 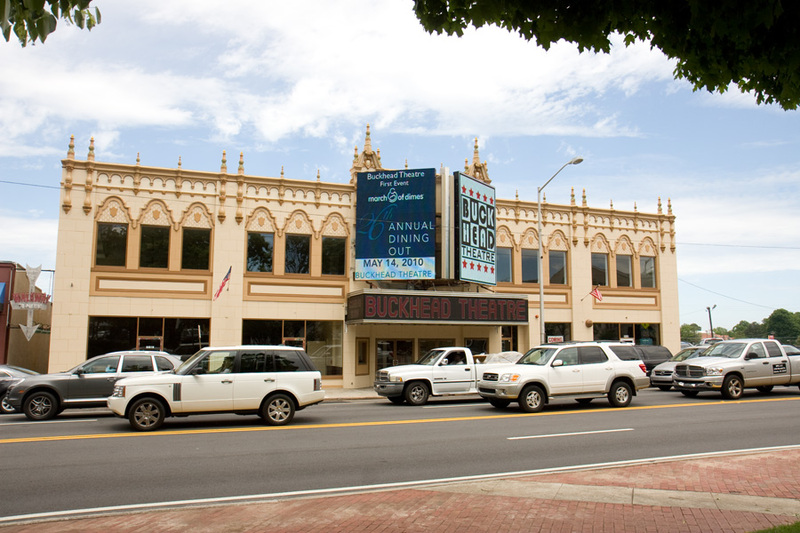 Buckhead Theatre was the original name of what was the community’s movie theater in the early 1900s. The building is located on Roswell Road, just north of its split from Peachtree Road. Charles Loudermilk, who is affectionately known by some as “Mr. Buckhead” and who founded one of the community’s most prosperous businesses, Aaron’s Rents (now Aaron’s Inc.), attended movies at the theater when he was 12 years old and it cost 10 cents to get into the movie house and 10 cents to buy a Coca-Cola. Loudermilk bought the theater a couple of years ago and committed to revitalizing it and making it an entertainment and community meeting centerpiece for Buckhead. On May 14, the theater hosts its first event since the renovations. The 26th Annual March of Dimes Dining Out fundraising event will conclude with “Stepping Out,” an after-party being held at the Buckhead Theatre. On May 4, work crews were still putting the finishing touches on both the exterior and interior of the building. 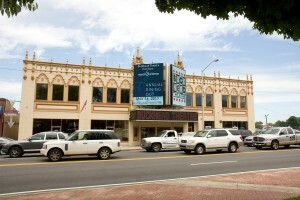 The old façade of the building, just across Roswell Road from the triangular Charles Loudermilk Park, has been restored to its early 20th Century look, except for a new high-resolution digital graphics marquee that will flash theater and community service announcements for 18 hours a day. It will be difficult to miss by anyone passing through Buckhead village. Inside, the revitalized venue appears to rival the venerable restored Fox Theater in Midtown. Chip Pottinger, construction and redevelopment manager for Buckhead Theatre, says upgrades to the interior of the 33,000-squre-foot, two-story facility make the space unrecognizable from what it was like two years ago. The interior design work has been done by Loudermilk’s daughter, Lisa deGolian, a professional interior designer. The interior space is designed to allow for multiple uses. On the main floor is a gathering area for events in the main theater, which also can be used for special events and as a sports bar for special national televised sports events. It has a large service bar to one side and the other side of the entry includes a dance floor. The spaces to each side of the main entrance are 2,500 square feet. Ornate doorways lead into the 8,000- square-foot main theater, which has two main levels for patrons—a lower orchestra area and upper area. There are no permanent seats in either of the areas, adding to the flexibility depending on the show taking place on any given night. The lower, orchestra area, which is closer to the stage, can have tables and chairs for dining, just chairs or be a standing area depending on the event. The upper area likely would have either chairs for a seated performance or be a standing area for other performances or events. On the second floor, there is about 7,000 square feet of conference-type space , which can be sectioned off into four smaller areas and also can be used for small or large social events. In the lobby area between the conference space and the theater balcony area sits a second fancy service bar. The theater balcony area has 260 permanently installed theater seats with cup holders that can be used for various types of events, from movies to musical performances to plays. Two structures were added to the original building. One is a two-story addition that houses modern restrooms on both levels. The second is a one-story addition, known as a “green room,” which is a performers’ lounge. Sometime in June, there will be two grand opening events—one an invitation-only event for about 300-400 people and then a public grand opening event with a big name entertainer. The facility is being managed by Novare Events and entertainment manager Alex Cooley also is working with the Loudermilks and the event facility. “Buckhead needs a lift right now,” Loudermilk said. He thinks the opening of Buckhead Theatre may be it.